Owning a pet is a lot of responsibility, and when you have to house train a puppy or have an aging dog who can't wait for you all day to go outside, it is important that you accommodate them. We wanted to find something else besides the regular puppy pads, and when we came across the Petzoom Pet Park Indoor Pet Potty, we at Consumer's Survey knew we found something worth checking into. We scoured hundreds of different reviews to see what others were saying about this product, and purchased it for ourselves so we could test it out. What Exactly is an Indoor Potty? A unique solution for living without pet accidents, this product is perfect when you come home too late to let your dog out on time, or if you can't let them out in bad weather. It works great as a training tool for your new puppy, plus is good in assisting an elderly dog who might not be able to make it outside to use the bathroom. This mat feels and looks like real grass, but is constructed of a synthetic grass material. Since it is weather proof, you can also place it out on a balcony or patio. It is safe and non-toxic for your pet to use, and it cleans up easily with just warm, soapy water. With a designated spot for your pet to go potty, you can keep them from urinating on your furniture or carpeting. It consists of a triple stage protection, allowing the fluid to pass through the mat, which is anti-microbial. The actual mat stays up above the liquid that collects in the tray beneath because of the elevated grid system. It can hold a full gallon of liquid; all you need to do is empty the tray at the end of each day. The surface of the Petzoom Pet Park Indoor Pet Potty stays sanitary and fresh. You can store this easily if it is not needed, and now you won't have to waste money on an expensive dog walker or on the messy puppy pads. 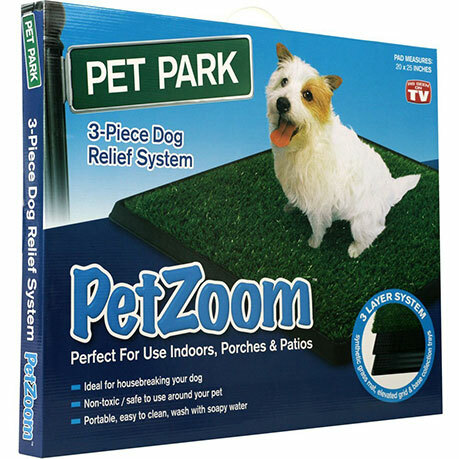 We can see where using the Petzoom Pet Park Indoor Pet Potty would be good for training a puppy or even for traveling in a camper or trailer, but not sure how this product would hold up over the long term. Many customers had complaints about the smell that lingered in the product after a length of time, even when they regularly cleaned it out with bleach thoroughly. This product does work for many pets, as they seem to like using it with no issues, even after they've been having potty problems in the home. It is especially good for smaller pets, as the tray itself that collects the urine is not very deep and could fill up too quickly if a larger pet was using it. Depending upon your situation and why you need this indoor potty for your pet, this could be a really great solution, but you need to consider your options and decide what is best for you and your beloved pet.